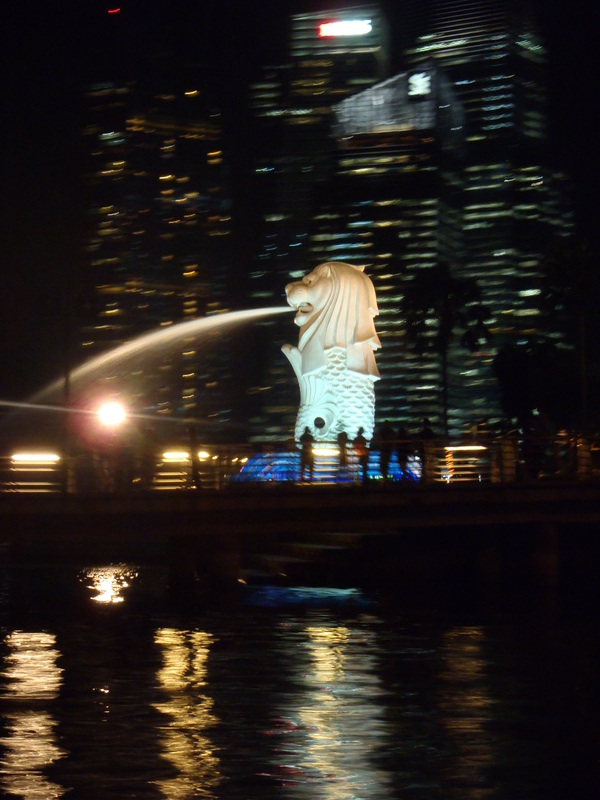 So I am back.. For now..
Singapore and Hong Kong was pretty amazing. I was flabbergasted at how different New Zealand culture and living circumstances are. Nuts! In Singapore we arrived at 6pm local time (or 11pm NZ time) and headed straight to our hotel. As soon as you step off the plane the heat just hits you. It is crazy hot and humid there. We then went on the Singflyer Flyer which is beautifully lit up. And being night-time, you get fantastic views of the whole city. You can really see how alive the city is at night time. Then feeling mega exhausted we went back to the hotel and collapsed into bed. The next day we dedicated to Sentosa island. We travelled onto the island by cable car (very neat) and proceeded to do the many attractions there including holding a snake (EEK! 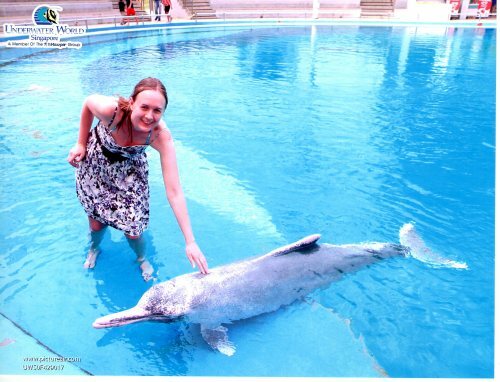 ), watching my first dolphin show, touching one of said dolphins (double EEK! ), and getting soaked by one of Singapore’s daily heavy rainstorms. We then went on a Chinatown Trishaw tour (as recommended by my friends Mark and Caren) which involved shopping in Chinatown markets, eating Chinese style, being carried round on a trishaw (very cool), riding on a bumboat down the river to see the Merlion before being dropped up in the club/bar area where we met up with my awesome friend Fiona. We then collapsed into bed again later that night. In the morning we went to the Jurong Bird Park and saw lots of lovely wildlife. The lizard in the below post was just sitting on one of the paths and pretty happy to have a photo with me. Then feeling pretty drained from the heat we got some lunch and headed back to the airport ready for the next leg of our journey to Hong Kong, and meeting Anth’s family (EEK). 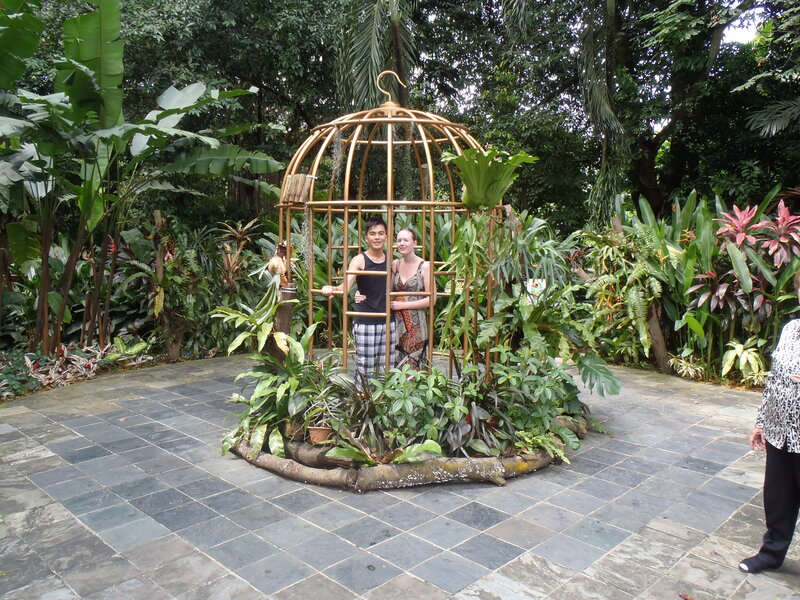 Trapped in a bird cage at the Jurong bird park!